It is available in the working widths 3, 3.5 and 4 m. for tractors from 120 to 320 HP. By reversing the position of the changeable gears by replacing it, it is possible to have available several rotation ratios of the rotors. This makes it possible to obtain the best possible performance of the power harrow depending on the type of soil, on the forward speed and on the required degree of crumbling. 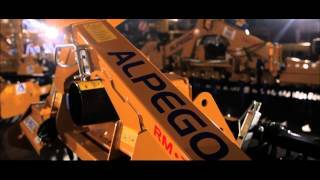 The leveling bar of the ALPEGO power harrows is directly attached to the rear roller. This makes it possible to maintain a constant height from the ground, thereby improving the leveling quality and reducing the power absorbed by the power harrow. The front guards prevent rocks from entering to cause rotor damage. The TWIN-FORCE system consists of two rotors mounted on conical bearings, joined together by one support. This allows for longer tines and guarantees high reliability and an increased efficiency also in conjunction with high tractor powers. The new drop forged tines are Available in the new version “Drop Forged Quick Fit” for models RK, DK, RmaX and DmaX and in the “Drop Forged Bolt-on” version for the models RmaX and DmaX. > Helical contour: it produces a top-quality crumbling while reducing the strain on the mechanic components of the power harrow. The QUICK-RELEASE system can also be supplied as a separate kit as an alternative to the traditional one. The CAGE roller is suitable for dry soils of medium density. With the extra kits (available only for the G5 series) it is possible to add some pipes to the cage, thereby increasing the supporting surface. The structure of the cage does not make it suitable to support very heavy loads, such as the combined implements. The SPIKE roller is very versatile, it works well even when the soil is damp and compacted. The SPIRAL roller creates a soft and uniform seeding surface and is suitable for medium and light soils. The PACKER roller has a tubular structure with a large diameter: this makes it very sturdy and particularly suited for the combinations with seed drills. Several rows of tines guarantee the traction on the ground and a series of adjustable brushes keeps each of them clean. The result is a compact surface, perfect for sowing. The GOMMA (rubber) roller is suited for combinations with seed drills for cereals: it guarantees that the seed is placed at a constant depth. The rubber covered surface and its large diameter decrease the clamming effect of the soil and makes it a roller suited for any work condition.